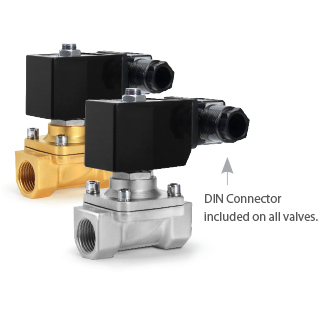 are compact, reliable, high flow, two-way pilot operated solenoid valves for air, gas, water and other liquid applications. They offer a normally closed design and can be mounted in any position. The solenoid enclosure provides protection against dust, dirt and other elements, while also protecting against seepage of oil and noncorrosive coolants. 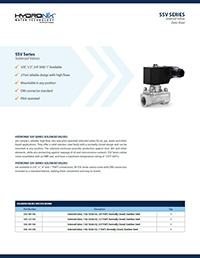 BSV Series valves come assembled with an NBR seal, and have a maximum temperature rating of 176°F (80°C).